Is there a way to make the swapping wand work with slabs on the top half of a block? There are many ways. Most tech mods have a way to do that. Like the powercells in rftools. EnderIO can do it too. My kid (6) is using your wands to make some things, and I'd like to comment on a small issue we ran into. 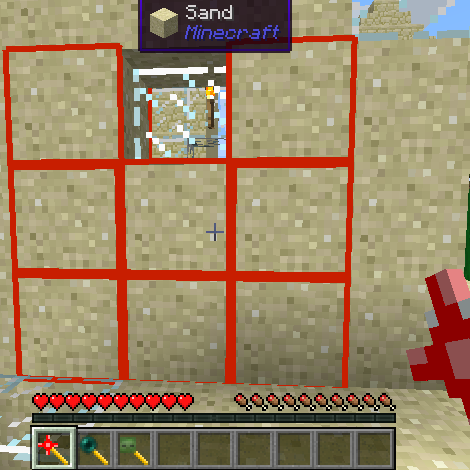 He was using the protection wand to build a permanent room that couldn't be broken. He came to me for help because he didn't now how to unprotect a block, so I explained it to him, but I realised it was kind of complicated and even I had a bit of a problem keeping track of when I was protecting or unprotecting. I even used the clear function by mistake and I had to start all over again. Is it possible to make it a bit more intuitive? I was thinking something like changing wand's color depending on the current mode. I found that the messages were not enough. For example, my kid is 6 and first language is not english, so a text message is not the best cue for him. Also, is it possible to add any kind of undo to clear? It was my first time using it, and I used clear by mistake (can happen, right? ;) ) and I had to protect the whole room all over again. That's when I thought my kid could have a few problems using this wand. Anyway, great mod, and thanks. Hey man.. I keep getting crashes. ): Could you help me out? I was unable to install NEW, until I downloaded mcjtylib; this was not in the dependencies category so I could not figure out how to install NEW until I saw a youtube video. Could you please put this up? ; either that, or pass this message along to compatlayer. Thanks! found out you can dupe rain shields (Random Things Mod) with your wand of moving. No big deal. Just lettin you know. Getting a crash in 1.11.2 which seems to reference the Teleportation Wand. What version of compatlayer do you have? How to change the configuration of the wands?